You'll be set with this simply classic bed in your home. The piece carries a sophisticated sable finish and features a clean, panel design with hardwood solids and straight lines. Create a sanctuary to leave the day's troubles behind you with help from this handsome bed. This bed is available in queen, king, and California king sizes. The Prescott King Headboard and Footboard Bed by New Classic at Michael's Furniture Warehouse in the San Fernando & Los Angeles area. Product availability may vary. Contact us for the most current availability on this product. You'll be set with the classic Prescott collection in your home. 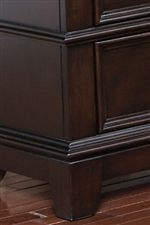 The bedroom pieces carry a sophisticated sable finish and feature a clean design with hardwood solids as well as straight lines. In addition, the ample storage options are great for keeping books, magazines, sweaters, jeans, blankets, towels and bedsheets. Create a sanctuary to leave the day's troubles behind you with help from the handsome Prescott collection. The Prescott collection is a great option if you are looking for Transitional furniture in the San Fernando & Los Angeles area. Browse other items in the Prescott collection from Michael's Furniture Warehouse in the San Fernando & Los Angeles area.